My first attempt to create a unit conversion program for Classpad was with the basic program called CPUnits. However I wanted to convert units directly in "Main" so after some search I managed to create a function to do it. 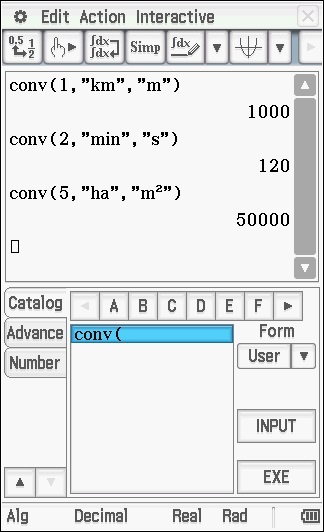 Unit Converter Function add a new command to your Classpad Catalog and allow you convert units directly from Main math. Do not forget to read the quickstart eActivity that explains how to use it. It is also compatible with cp300/330 models. Is there anyway to write in a function that could convert mmHg into atm for pressure?